Do you want to start a small business in Vermont but don’t know where to begin? 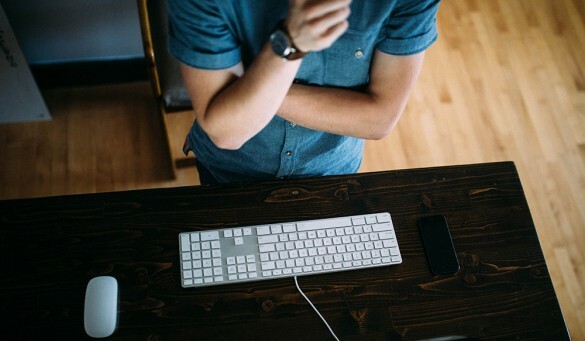 If you haven’t started a business before trying to navigate this process can seem overwhelming, it’s actually quite simple. The following list will walk you through the legal steps necessary to register your business and get it off the ground. As I’ve worked on many projects of varying sizes over the years, I’ve had the chance to work work with different small teams of individuals and for small companies. While never being inside the corporate machine, I’ve had a good look into the work of team collaboration and an understanding of how this helpful principle can become something detrimental. 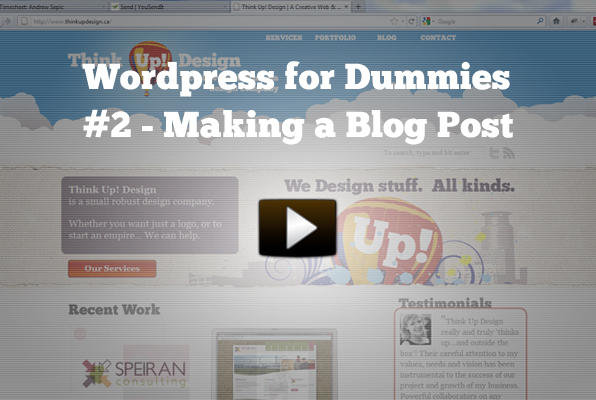 This is a simple screen cast to help people who need to know how to make a blog post with their WordPress site. It’s super simple! And once you understand the difference between Pages and Posts in WordPress you’ll be all set to begin adding content to your site in the right way. WordPress organizes it’s content into 2 major different content types; Posts and Pages. You can find out more about the depth of creating using posts and pages by following these links more about Posts and more about Pages. But essentially the difference is that pages are always available on your site in the same place. We use pages for things like the Homepage, the services page & contact page. Posts are content that is organized based on time. So WordPress posts are good for things like articles, new items or plain old fashioned blog posts. Have a look at the screencast for a step by step to creating blog posts and setting up your blog page. Right now, U.S. congress is holding hearings on the first American Internet censorship system. This bill can pass. If it does the Internet and free speech will never be the same. SOPA also known as the ‘Stop Online Piracy Act’ is an attempt by Hollywood & U.S. corporations to pass through congress a bill which will allow them to punish sites who allegedly are ‘dedicated to the theft of U.S. property’. But this bill isn’t going to just aim at peer-to-peer sharing sites in Iran, but will also clamp down onto many American sites and web companies potentially creating huge ramifications that will effect everyone’s use of the internet. Sites like Twitter, Tumblr, and other social media networks as well as Cloud Computing could even be effected by this law. At Think Up! We’re really scared about how this bill will impact freedom of speech and equal rights to information on the internet. A wolf in sheep’s clothing, SOPA will give huge power to corporations and anyone who feel’s their rights have been infringed upon, to choke out and block access to sites which have supposedly been at fault. Notice the nice ‘Stop Censorship’ notice that is blocking our Logo? If you run a website and are worried about you rights, please find out how you can add a censorship notice to your site and how you can help spread this information to others so that this bill will be turned down. Find out how you can help here! For more in depth reading on the hazards of SOPA, read the following articles..
After building quite a lot of WordPress sites for clients (I’ll make an official tally soon), I’ve also spent many hours in basic hands-on training to help clients become familiar and comfortable in controlling their new powerful & smashingly well designed website. While this is always a fun part of the job, time can begin to add up and if the client can’t take notes or has to ask again later on for a ‘refresher’ the fun can slowly become a dull ache. 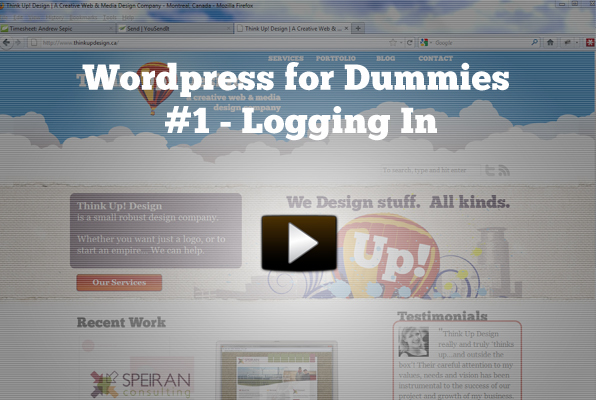 So the logical next step was to create a series of simple tutorials which cover WordPress basics for the new user (unfortunately called a Dummy). So I’m proud to begin this series that will help many of my clients and hopefully other bold new WordPress users who find their way to Think Up! Design via the intraweb. Please feel free to leave a comment if this was helpful, or maybe a suggestion if you feel something was left out. Ok, so the website is up? What do I do now? This basic WordPress tutorial is to help people take their very first steps with their new Website. After watching this brief tutorial you’ll be ready to sit in the comfy chair of your very own Website Control HQ.